An expert guide will accompany you through the heritage district, the Quadrat d'Or: a true open-air museum right in the centre of Barcelona's Eixample neighbourhood. 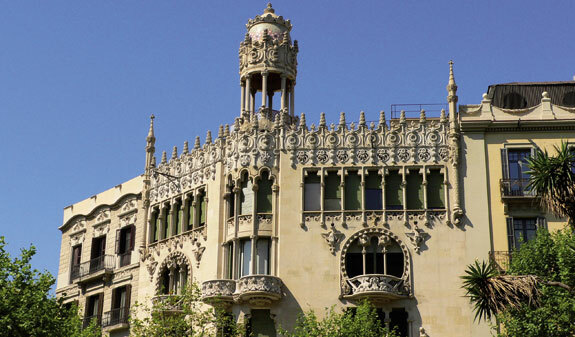 You'll also be able to admire works by architects such as Gaudí, Domènech i Montaner and Puig i Cadafalch. Although this route covers pedestrianized streets and public thoroughfares that have no accessibility problems, wheelchair users may require assistance to enter the lobbies of certain buildings. The route doesn’t include visits inside any of the featured buildings as most of them are private properties or charge for admission. In some cases, you can visit the lobby or foyer. Palau de la Música Catalana, the restaurant “Els 4 Gats”, Cases Pons i Pascual, Casa Antoni Rocamora, Casa Heribert Pons, Casa Jaume Moysi, Casa Sebastià Pratjusà, Casa Climent Arola, Editorial Montaner i Simon (Fundació Tàpies), L’Illa de la Discòrdia (Casa Batlló, Casa Amatller and Casa Lleó Morera), Casa Vídua Marfa, Casa Milà (La Pedrera), and Casa Ramón Casas. As a rule the guides take into account the requirements of people with reduced mobility: they will do their utmost to keep barriers to a minimum and make it easier for them to get around. An induction loop can be hired at the tourist information office in Plaça Catalunya. This device is used in all Barcelona Walking Tours and help the hearing impaired person to follow the explanations of the guide. A cash amount or credit-card deposit is required. 1. Place the induction loop receiver around your neck. 2. Connect the induction loop to the audioguide system. 3. Switch your hearing aid to position T.
Restaurant “Els 4 Gats”: the width of the door and the step make access difficult for wheelchair users. Cases Pons i Pascual: there is a small step at the entrance. Casa Vídua Marfà: there is a small step from the road at the entrance to the lobby, and there is a flight of four steps leading to the doorway inside the lobby. Palau de la Música Catalana: the entrance is at the back of the building and you can visit the foyer. Write the result of the calculation "2 - 9"